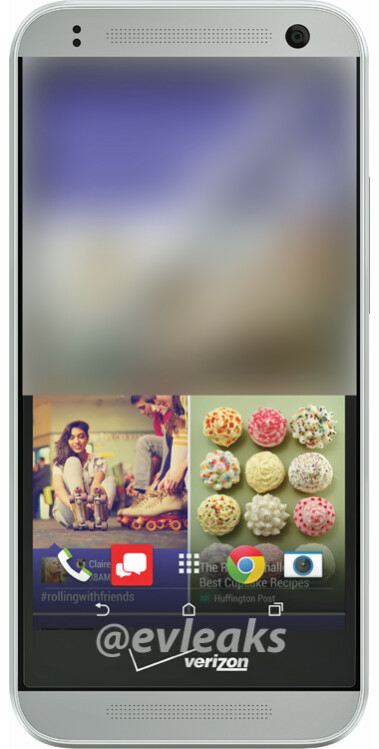 We now have a visual confirmation of the fact that the so called HTC Remix is indeed an HTC One mini 2 variant for Verizon Wireless. @evleaks today revealed the first image that shows a Verizon-branded HTC Remix, and, sure enough, this looks just like the One mini 2 that was officially announced by HTC two weeks ago. While HTC said that the One mini 2 would be released starting June, there are no details on when Verizon customers should expect to see the Remix in stores. However, we’re assuming it will happen in the next few months. The One mini 2 is a bit thicker than the HTC One M8, but it’s smaller overall, since it sports a 4.5-inch 720p display, and not the 5-inch 1080p screen of the M8 flagship. Size aside, there are other differences between the two devices: while the One M8 is a high-end offering, the One mini 2 is a mid-range product that features a quad-core Snapdragon 400 processor and 1GB of RAM. The new mini smartphone also doesn’t have the UltraPixel Duo camera of the M8, instead coming with a regular 13MP rear camera. All in all, the HTC One mini 2 / Remix seems to be a solid offering for customers in need of a smaller, but still capable Android KitKat smartphone. Dafuq? That seriously has to be a joke. All the other One variants have the Verizon Logo on the back. In fact that's where the logo should go for all Verizon phones. It really mar's the look of the phone, especially on the Note 3. All the nice things you get with an all powerful duopoly. Yeah. Apparently no one can learn from the huge interest in the Z1 Compact. That's how it should be done, a mini version of the flagship without sacrificing the specs. At the very least HTC should underclock the 801 while maintaining the 2GB RAM. The 720p resolution is fine though. So far I'm getting mixed reviews about the camera but I'll trust Phonescoop's assessment more than the others. Forget about the Z1 Mini, I hope Verizon gets the Z2 and hopefully a Z2 Mini is in the works. If Sony would make use of the top and bottom bezels in placing better speakers I would definitely buy one. I love my Z2 The all DragonTrail glass finish with that extra 170Grms of weight feels solid in the hand. Class and premium just like the M8, but M8 is lighter. I prefer matte black with red accents like the HTC Droid DNA/ Butterfly but I still like my gunmetal gray M8. Spends half the time in a Urban Armor Gear case anyway. I like the color scheme I got going though as the front face is fully visible with the case on. Are you kidding me, Verizon? That logo placement is almost as bad as the Note 2 abomination. Chill out.